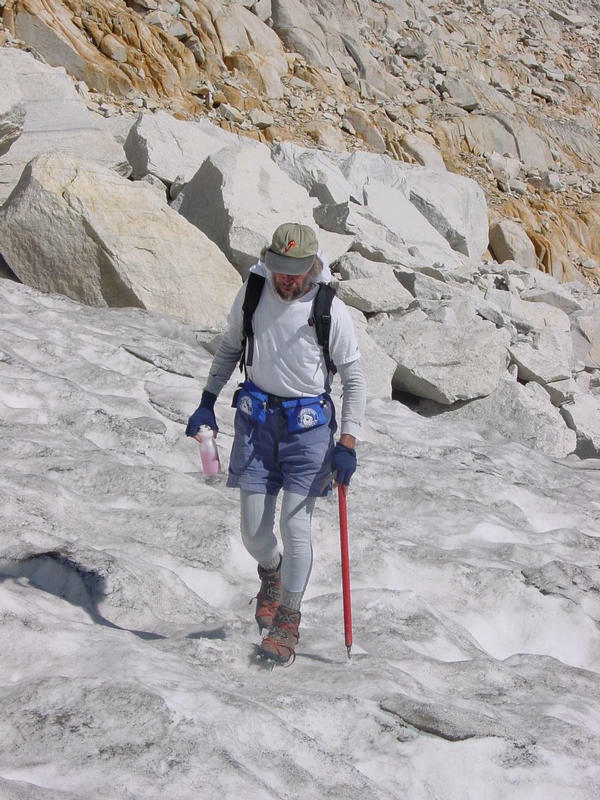 Conceived as a multi-day hike and climb-a-thon, the 2001 Challenge was to cover 182 miles and over 54,000 vertical feet, reaching the summits of 10 of the most impressive peaks in the High Sierra - all in the span of 10 days. Judged on the turnout of participants, the 2001 Challenge was unsuccessful. Interest waned in the month prior to the event, and only two climbers turned out for most of the hikes. In the week leading up to August, only David Wright was committed to climbing, or attempting to climb, most of the peaks with myself. Judged on the enjoyment shared by the participants during the event, it was hugely successful. For myself, it soundly met the primary purpose of being a physically demanding, but achievable endurance event. I was able to summit 8 of the 10 peaks, some with David and others, most solo, all of them memorable. I had so much fun in fact that I'm planning a new Sierra Challenge for August 2002. Below is the summary of the 2001 Challenge. There are long-winded trip reports and hundreds of photos to peruse for those who need an excuse to not get something important done at work. If you have an interest in the 2002 event, contact me at snwbord@hotmail.com. Happy climbing! 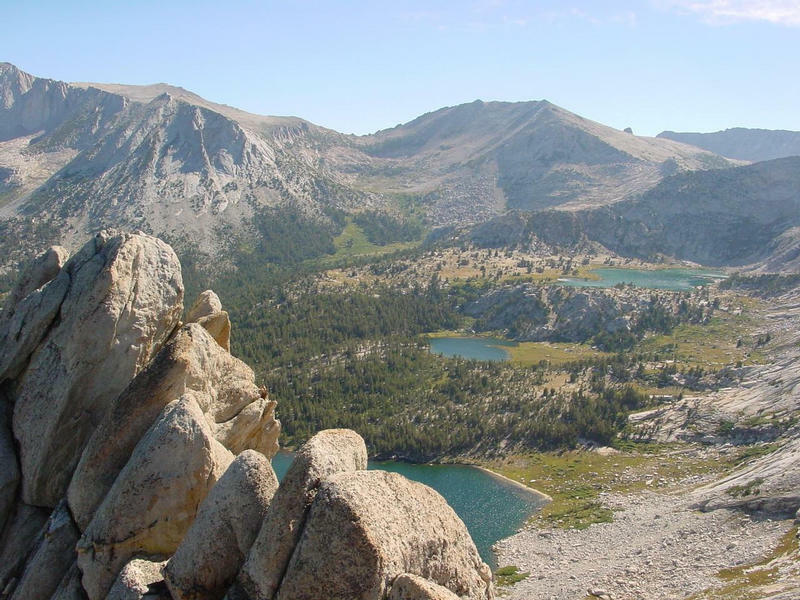 I drove from San Jose to Yosemite Thursday evening, spending the night atop Gaylor Peak, just off Tioga Pass at 11,000 feet as a way to begin acclimatizing for the main event on Saturday. The temperature was a balmy 50 degrees on the summit, and where I bedded down under some wind-beaten pines, I slept soundly. I awoke early to hike back down undetected by the rangers, who would not have thought highly of my illegal camping activity. On Friday morning I climbed Ragged Peak in Tuolumne Meadows as a warm-up. Though not a long or difficult hike at all, the climbing at the summit has some fun class 3 blocks. The views are outstanding, taking in much of the Yosemite High Country. In the afternoon I drove down to Lee Vining where I spent the rest of the day, and where I slept for the next two nights. Up at 5a on Saturday morning, I drove out to the trailhead at Twin Lakes for the hike to Matterhorn Peak. Only one other participant, David Wright, showed up, and the two of us would constitute the entire team for the next 7 days. Under gorgeous skies we climbed Horse Creek Canyon, and followed it for hours until we reached its head at Horse Creek Pass. Shortly before the pass another climber, unrelated to the Challenge, caught up with us. Brent joined us as we made our way to Matterhorn's summit via the SE face. After 45 minutes on the summit, Brent and I began to seriously wonder what happened to David who had been slower on the asent. Climbing back down, I found David resting at the top of the East Couloir on the East Ridge, having given up on what he thought was a class 3 route. While Brent descended, I went with David back to the summit, showing him the class 2 route. It would have been unfortunate to have been stopped so close to the summit! On the decent I chose to return via the East Couloir while David returned the same route we came. The couloir was snow-free save for a few easily crossed sections in the middle. At the bottom of the couloir I found the top of the glacier frozen and steep, and me without my crampons - it made for a memorable descent. David and I joined back up in Lee Vining where we had dinner and spent the night. Up even earlier at 4a on Sunday, David and I would need all the daylight we could get for the 27 miles we had to cover today, the longest of the ten hikes. We started hiking shortly before 5:30a, using flashlights for the first 30 minutes or so. We enjoyed a leisurely hike in the early morning hours through Lyell Canyon, fog drifting above the creek, deer quietly grazing, smoke from various campfires rising through the trees. Leaving the trail shortly before Donohue Pass, we struck off cross-country for the Lyell Glacier. Several hours later when we reached the glacier, we donned crampons and with ice axe in hand, headed up towards the East Arete of Mt. Lyell. At the top we were stopped first by a gaping bergshrund. Overcoming that, we were halted by the technical difficulties found on the ridge. In this low snow year, the route was much different, and much more difficult than when I had climbed it previously. David turned around at this point as it was already 1p. I retreated off the East Arete, but persevered, climbing up the center of the NE face to finally reach the summit. I found David again on the way back, and it was a long haul to get back to the trailhead before dark. I left David once we were back on the trail, and didn't see him the rest of the day. He failed to show up at the designated motel in Mammoth that night. Monday morning I drove out early to Agnew Meadows near Devils Postpile. I failed to find David at the trailhead (he decided to take a rest day), and struck out on my own. Rather than climb Mt. 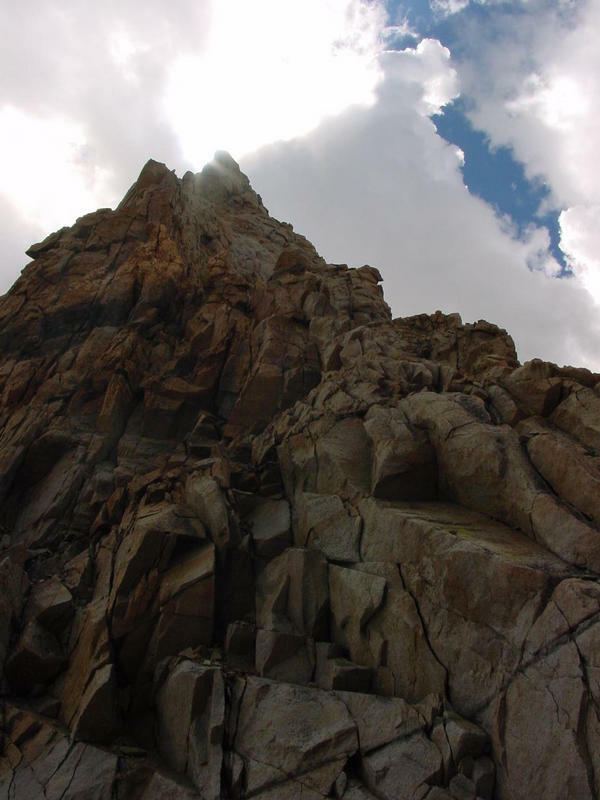 Ritter, which I had previously climbed as a dayhike a few years earlier, I changed my mind and set my sights on Clyde Minaret as a worthy alternate. 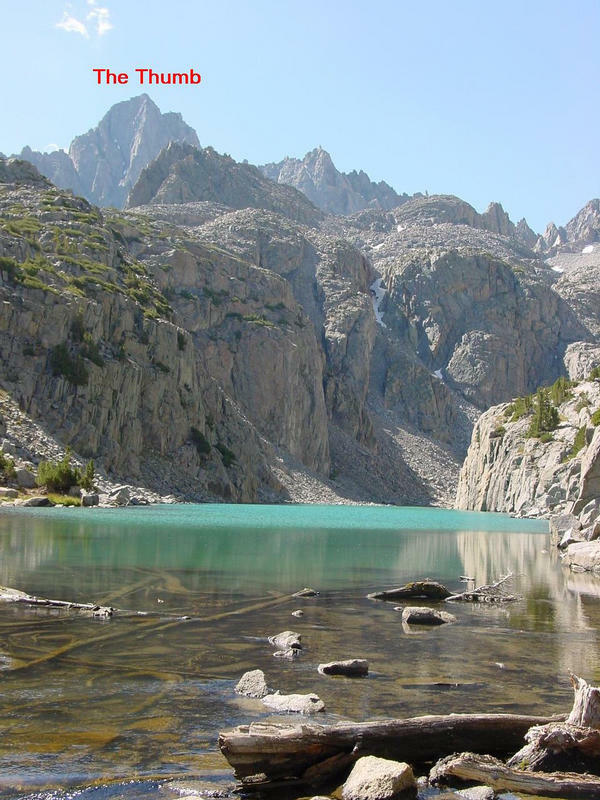 The hike follows the beautiful Shadow Creek to Ediza Lake, following the same route as that for Mt. Ritter. At this scenic lake I continued south past the stunning alpine scenery of Iceberg and Cecile Lakes. Interesting class 2-3 climbing led up 1,000 feet to the beginning of the more technical section comprising the top 1,000 feet of Clyde Minaret. I got about 40 feet up the base of the Rock Route before turning around. Seems I had started up the 5.6 chimney at the base without knowing the difficulty ahead of time. Hiking in tennis shoes, I was no match for this section. I knew the easier class 3 route went up a ramp above the nearby snowfield, but without crampons I couldn't safely cross the frozen snowfield to reach the ramp. 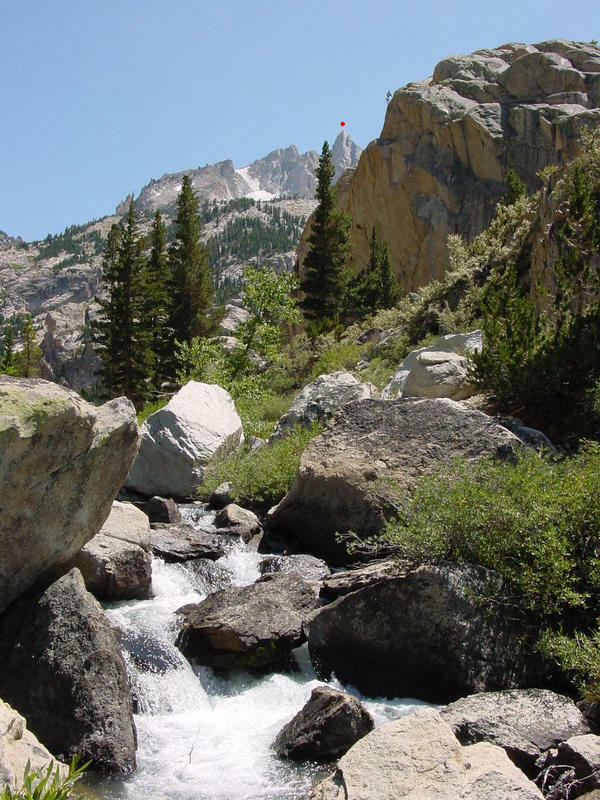 I took a different route back, following Minaret Creek down to its junction with the JMT, and from there to Devils Postpile. I used the convenient shuttle bus to get back to my car at Agnew Meadow. Still not finding David upon my return to Mammoth, I concluded that David must have decided to go home after Mt. Lyell. Tuesday I was up early again, and at the Mosquito Flat parking lot in Little Lakes Valley. To my surprise I was greeted by David who was waiting there for me at 6a. With only 10 miles to hike, Mt. 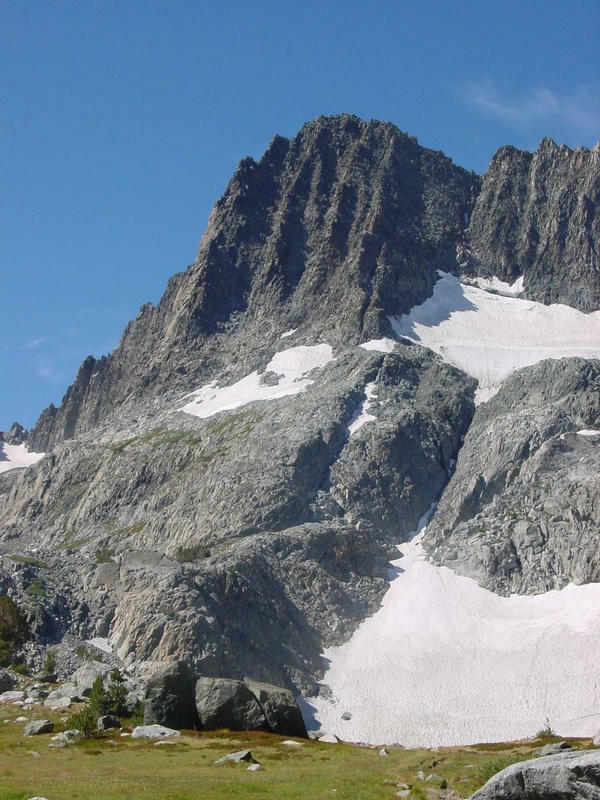 Abbot was the easiest of the ten peaks to dayhike, though it still required glacier travel and class 3 climbing. The weather was fine as we hiked up to Ruby Lake and took in the spectacular views of this picturesque valley. We crossed the glacier and headed up the North Couloir. The snow in the wide couloir reached only about halfway up, far lower than usual for this time of year. We found the exposed middle section very loose and unstable, and we took great care not to unleash stones down on each other. The class 3 climbing in the couloir is sustained, and it was either very fun or mildly terrifying, depending on whether you were asking myself or David. When we topped out on the ridge to the north of the summit I thought we were home-free, but David stopped at the airy bridge. I could not convince him to continue, so he waited there while I went up and tagged the summit. We retreated under threatening skies, and climbed together until we were back on the glacier. I then left David as I notched up the pace, and made it back to the trailhead as the first peals of thunder were to be heard. David make it back an hour later, and was likewise spared from all but a few raindrops. We regrouped in Bishop where we would sleep for the next few nights, and had dinner while we planned for the next few days. David had no intentions of climbing Humphreys' class 4 summit, and so we agreed to go at our own pace for the next few days. 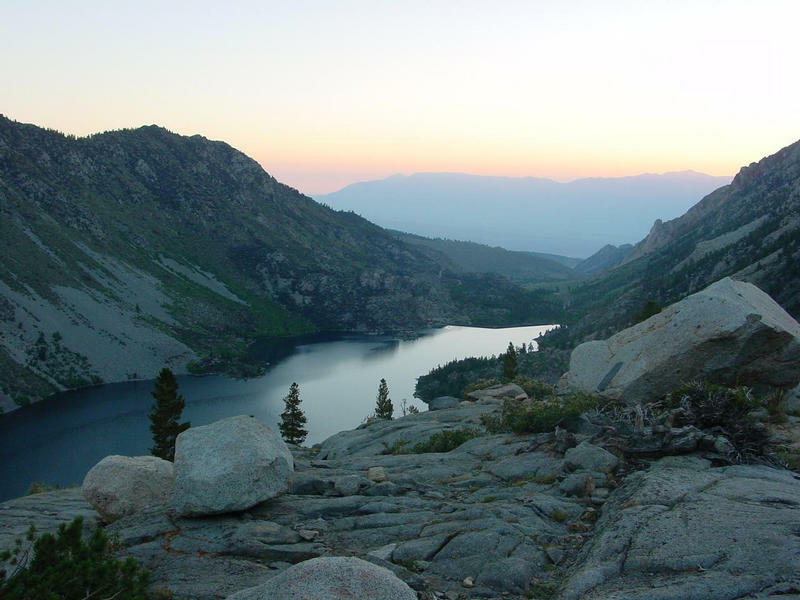 I got up early Wednesday, leaving David to sleep in, then drove up to North Lake and the Piute Pass Trailhead. Starting out in darkness, I sped up the trail reaching Piute pass in a few hours. I then left the trail and headed north towards Humphreys Lake and Mt. Humphreys' Southwest Face. At the lake I met a family with a 9 yr-old boy who'd just climbed Mt. Humphreys the day before. Mom gave me some advice for climbing the lower part of the face, which resulted in me thrashing about on some loose class 4-5 terrain that I shortly backed down from. I found a wide chute on the far left side of the face that provided a much easier route to the upper mountain. Other than a single class 3-4 chockstone that needed to be surmounted, the whole chute was class 2. Once I reached the notch on the Northwest Ridge, the climbing became far more exciting class 3 with two short class 4 sections that provided some thrills. I reached the summit just as thunder boomed five miles to the southeast. I beat a hasty retreat as I did not want to have another run-in with lightning, and only felt relaxed once I got back down to the notch. Fortunately only a few raindrops fell on me as I climbed the rest of the way down Mt. 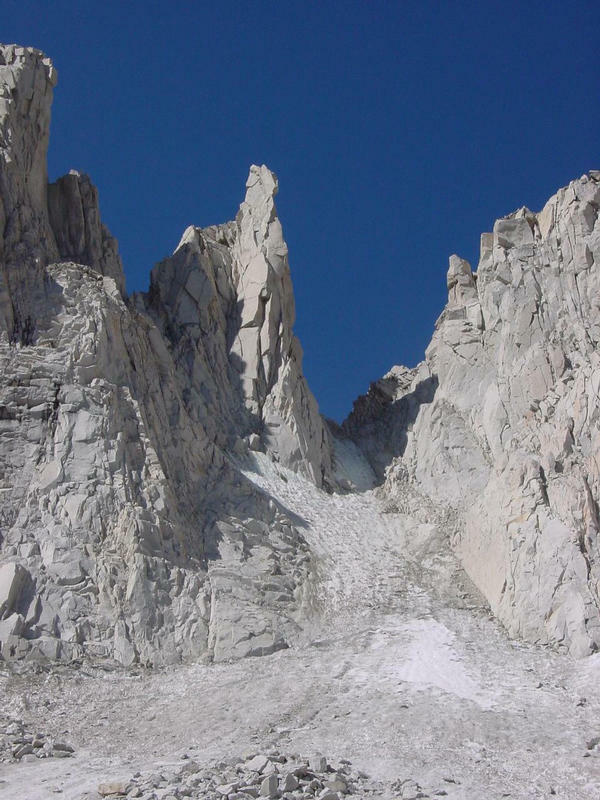 Humphreys' Southwest Face. As I returned to Piute Pass, I must have passed David who had hiked as far as the base of the Southwest Face. 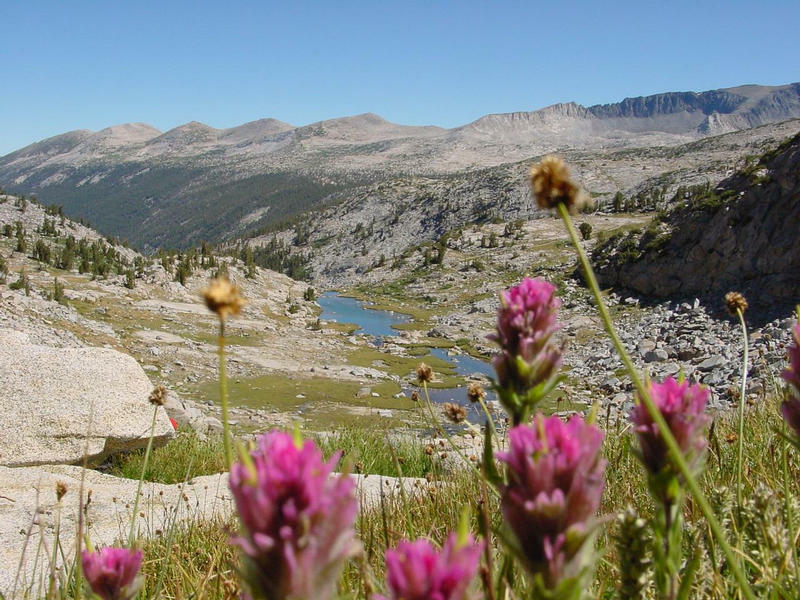 It's easy to pass within several hundred yards of someone without seeing them in the upper Humphreys Basin, as the hillocks and uneven terrain limit visibility. On the way back down the Piute Pass Trail the rain started on and off, never very heavy, but constantly threatening. Just as I reached the parkinglot David came strolling up from behind, having finally caught up with me after jogging most of the trail down from Piute Pass. We returned to Bishop for a shower, dinner, and retelling of the day's adventures. Like the previous day, Thursday's climb to Mt. Darwin involved class 4 climbing which David had no desires to partake in. So again I drove myself to the trailhead very early in the morning, starting out from Lake Sabrina in the dark. The sun came up an hour later and the dawn took on radiant colors as I climbed in the cool, quiet morning above the lake. 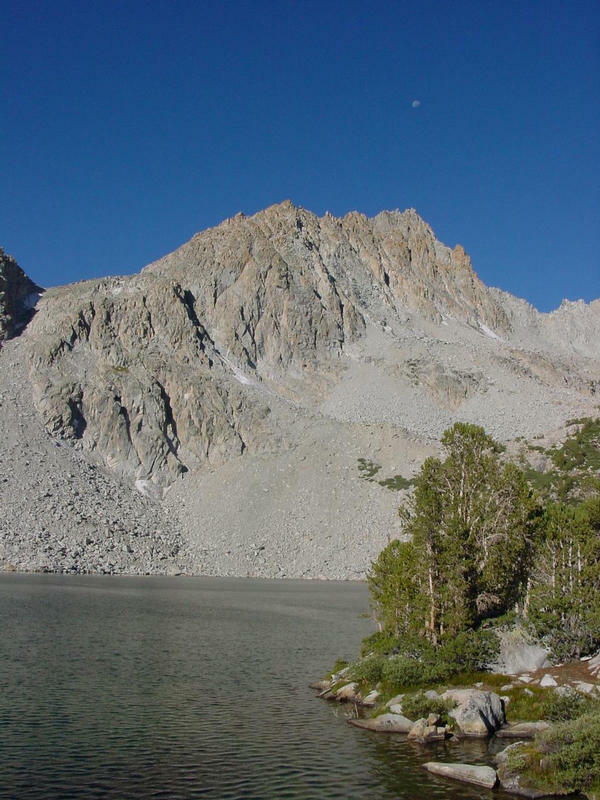 I reached the end of the trail at Midnight Lake (where David would hike/jog to later in the day), and turned west up the jumbled talus and boulder fields on Mt. Darwin's east side. The climbing was tedious but straightforward until I was at the base of the Northeast Ridge just below 13,000 feet. As Mt. Darwin's most direct approach, I chose to climb the East Face, Right Side route, but the crux was reaching the face by climbing a 60-foot class 4 chimney on the Northeast Ridge. About 15 feet of this chimney made me quite nervous, but thrilled when I was able to overcome it. The long, diagonally traversing climb of the East Face was steep and loose, but no more than class 3, and that only in a few places. A narrow chute led me to the summit block which required an airy traverse around its back side where the summit was most easily gained. This was technically the most difficult peak of the group, and certainly the most thrilling. It took as long to descend the upper mountain as it had to climb it, and the reverse move on the crux was a tad more thrilling than the ascent had been. It was a long hike back to the trail, and from there another eight miles to the trailhead. It was well after 6p before I motored back into Bishop where I found David, relaxed and rested for the last several hours. It was now my turn to start looking the worse for the wear between the two of us. Rather than attempt North Palisade on Friday, I cried uncle and begged for a rest day. So instead David and I drove out to Big Pine to make an attempt on Middle Palisade, another 14er a few miles southeast of North Palisade. Neither of us had been hiking in the South Fork of Big Pine Creek area, and we found it enchanting. We left the trail a short distance from Brainerd Lake and struck out cross-country, climbing some steep granite slopes below Finger Lake. This thin, narrow lake came as a surprise to us, an absolute gem in stunning surroundings. We climbed up further, reaching a point a short distance from the Middle Palisade Glacier. At this point we both admitted ambivalence about reaching the summit, and decided to call it a day. We took our time returning, but were still back to the trailhead by mid-afternoon, which gave us time to recoup, eat, and get plenty of sleep for the next day. Sometime in the middle of the night, David's co-worker Toby showed up and crashed on the floor of David's motel room. 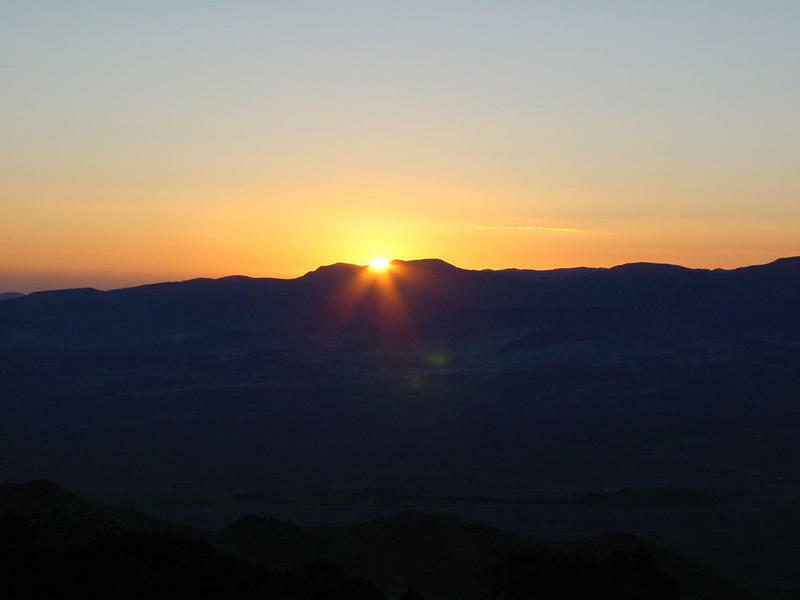 We were all up at 4a and on the road before 5a, heading for the Split Mtn trailhead. We were depending on Toby's arrival as he had the only 4WD vehicle capable of negotiating the torturous road. Surprisingly we had no navigation errors, and we were at the trailhead by 6a. By 8a we'd reached Red Lake, or at least I had, as I waited for the other two to catch up. 50 minutes later I was convinced they had passed me somehow and continued on. We regrouped about 30 minutes above Red Lake and climbed together into the upper canyon. Toby, having no time to acclimatize, was feeling poorly and decided to call it quits. He rested at the base of the snowfield on some large boulders while David and I continued. I reached the summit shortly after noon, but it was another hour before David made his way to the summit. Calling on all his reserves, he amazed both of us with his perseverance. On the way down we picked up Toby who was getting antsy after waiting around over 3 hours. We cruised past the beautiful Red Lake again, found the trail, and returned to the trailhead by 6p. Sunday was expected to be one of the easier days, hiking the class 1 trail to Mt. Whitney. Toby left in the morning to return to the Bay area, deciding he'd had enough of an adventure the day before on Split Mtn. I drove early down to Lone Pine to pick up the permits and head up to Whitney Portal to meet with some other hikers who planned to join us. I found Clem and John, our two southern boys from South Carolina as expected, but not my friend Monty with his brother. David showed up and started hiking solo, Clem and John had already started ahead, and shortly before 7a I gave up waiting for Monty and headed up myself. 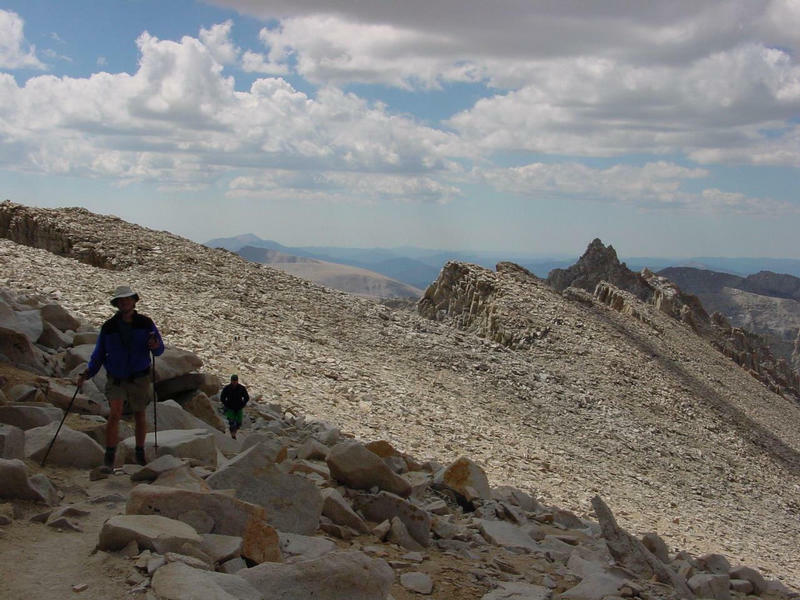 It was a fine day with a raft of people heading to Whitney's summit, one of the most popular trails in the Sierra. Shortly before I reached Trail Camp I came across Monty and Martin, who had started out at 5a, well ahead of the rest of us. The three of us continued up together until halfway up the 99 switchbacks, at which point I motored ahead. Shortly after reaching Trail Crest, I left the main trail and headed up the short distance to bag Mt. Muir. After coming back down and heading to Mt. 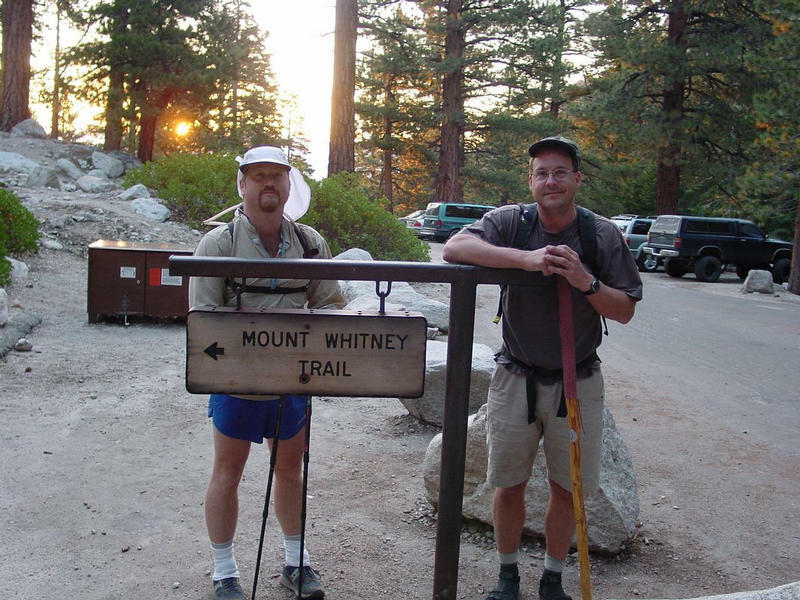 Whitney, I passed Monty again, and soon met up with his brother Martin who was at the summit. I began to consider climbing Mt. Russell to the north and climbed partway down Whitney's North Slope to check things out. Deciding my tennis shoes weren't safe enough to descend the North Slope, I headed back down the regular trail, stopping to bag Keeler Needle, Crooks Peak, and Discovery Pinnacle on the way. In between Crooks and Discovery Pinnacle I came across John and Clem on their way to Mt. Whitney. We sat and chatted for half an hour, telling yarns while catching our breath. They'd had no time to acclimatize and were feeling it now, but eventually made it to the summit. Finally deciding I'd had enough climbing, I headed back towards Trail Camp. I came across Monty and Martin on the way down, and the three of us continued together all the way back to Whitney Portal. We celebrated with beers at the store there before heading back to Lone Pine for dinner. David had made it rather easily to the summit, but somehow I missed him somewhere up there, probably passing each other while I was off on one of the subsidiary peaks.